Most of the data reported here are historic, although I’ve found a couple forecasts from Pricewaterhouse Coopers for stadium building, and ticket and merchandise sales, 2008-2019. 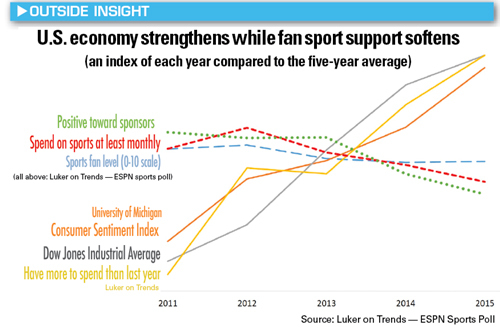 A small chart contrasting data on sports attendance spending vs. consumer confidence 2011-2015 was published by Rich Luker, who runs ESPN’s annual Sports Poll. I suspect we could find more historic data for both lines to create an expanded chart. I’ve found several polls describing sports fandom. For the most port, the polls give percentages of respondents, rather than raw figures. Harris’s poll presents the oldest data I’ve seen (back to 1985), although I believe ESPN’s poll has been running for longer than it’s published data would suggest (chart shows data back to 2000, but I think the polls have been running since the mid ’90s). 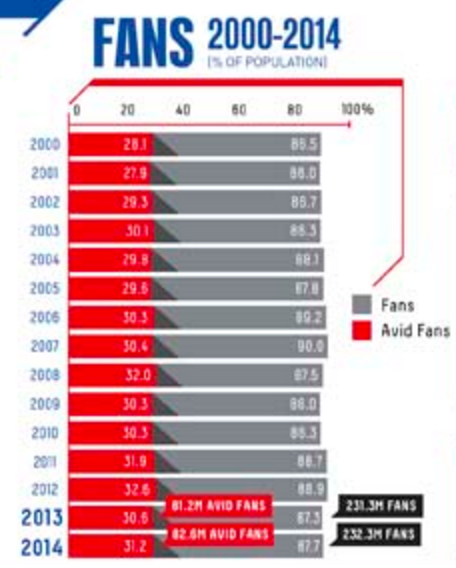 I’ve collected major league attendance for the NBA and MLB are available back to 1981, and for the NFL back to 1994. Older NFL attendance available is probably available, somewhere. Team Marketing Report publishes a “Fan Cost Index” which tracks the prices of tickets, as well as other typical spectator expenditures (eg: hot dogs, beer, etc). I’ve found their data for NFL ticket prices back to 2006 via Statista. We should try to contact them for more data. In 2015, 23.4 percent of Americans spent on sports at least once a month, a 6 percent decline from the average 24.9 percent for 2011-14. This trend, if it continues for five more years, will reduce the number of people spending monthly by 10 million. The University of Michigan Consumer Sentiment Index, which measures consumer confidence, rose by 21 percent in 2015 compared with 2011-14, and the Dow Jones Industrial Average was up 24 percent in 2015 compared with 2011-14. These three sources of data, showing similar growth, indicate a context where more frequent spending in sports should have taken place. And generally, for more than 22 years, engagement in sports has mirrored the performance of the economy and personal finances. We noticed a shift in those trends around 2011, when it seemed the economy was perking up. The percentage of American sports fans remained near a very stable 88 percent from 2011-15, but avid fans declined by 2 percent in 2015, and those who placed a high priority on time and investment in sports interests dropped 4 percent. Similarly, 4 percent more Americans said they were “less interested in sports than they were the year before” in 2015, compared with the 2011-14 average. 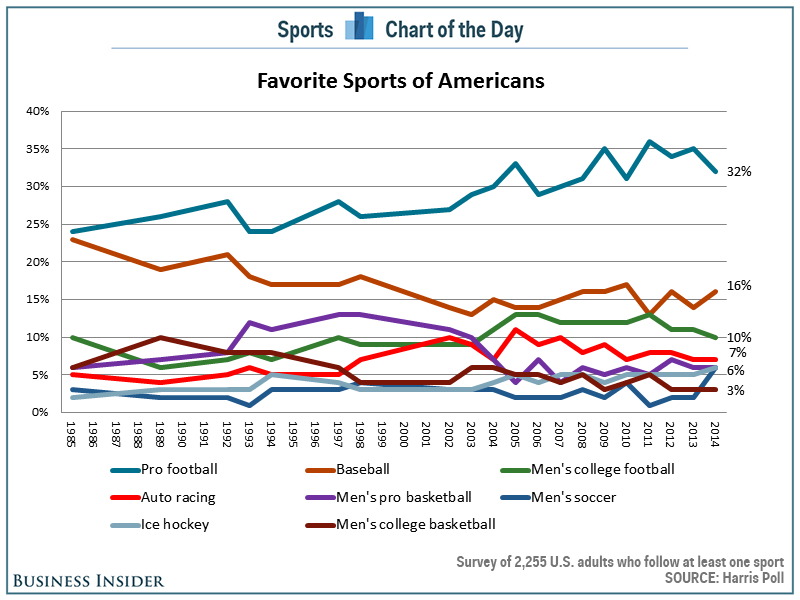 Harris has run an annual poll at least since 1985 asking what Americans’ favorite sports are. In this chart, data is only available for the latest year (2014), but we may be able to obtain figures for the preceeding years by contacting Harris. TO DO: CONTACT HARRIS TO ASK FOR HISTORIC DATA POINTS. 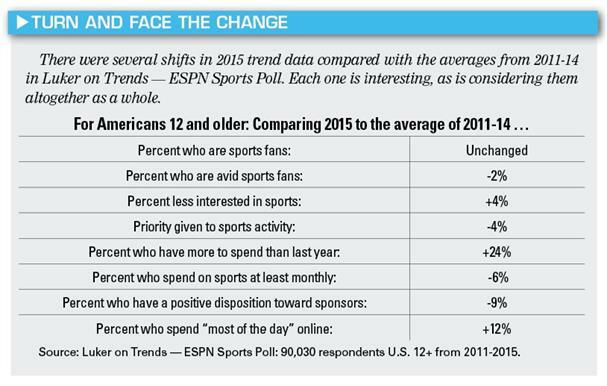 A much simpler, semi-regular Gallup poll, 2001-2015, simply asks if people consider themselves sports fans. Jeffrey M. Jones. June 17, 2015. 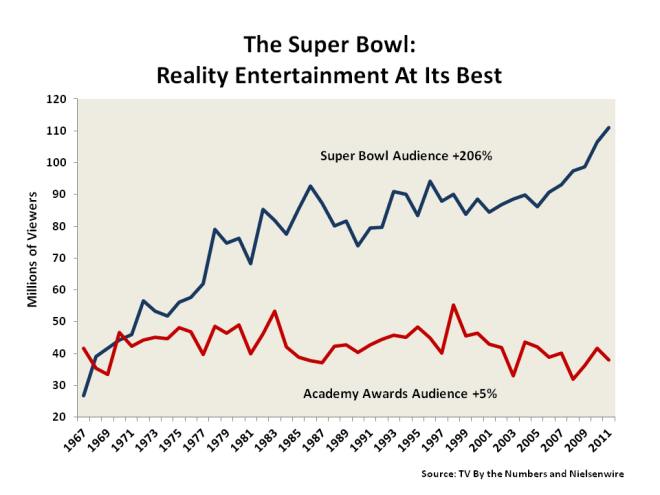 “As Industry Grows, Percentage of U.S. Sports Fans Steady.” Gallup. The ESPN Sports Poll, run annually since 1994 by Rich Luker, defines percentages of fans and avid fans, and, by subtraction, non-fans. 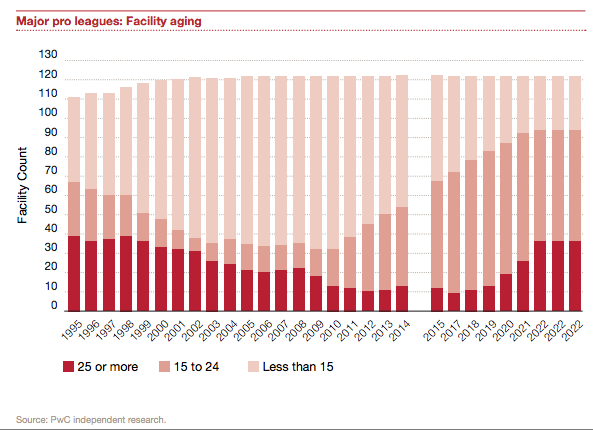 This particular graphic only give data back to 2000, but we may be able to ask Luker (or his colleague) for older data. Jess3 (the graphic’s designer), 2015. The ESPN Sports Poll has also been tracking college sports fans at least since 2000. 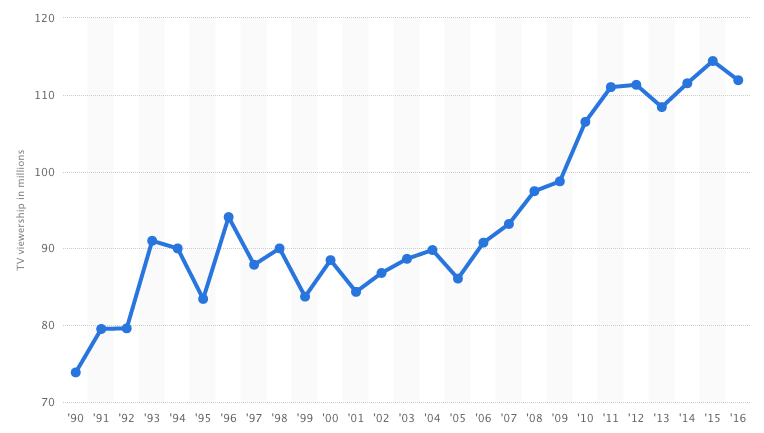 This chart shows percentage and numeric data for 2000-2010. Kenneth Cortsen. August 16, 2013.
src: Adam W. Jones (editor). “PwC Sports Outlook.” PricewaterhouseCoopers LLP. TO-DO: EXTRACT THE ANNUAL DATA FROM THE DATA LINK (HOVER MOUSE OVER EACH DATA POINT ON THE CHART). 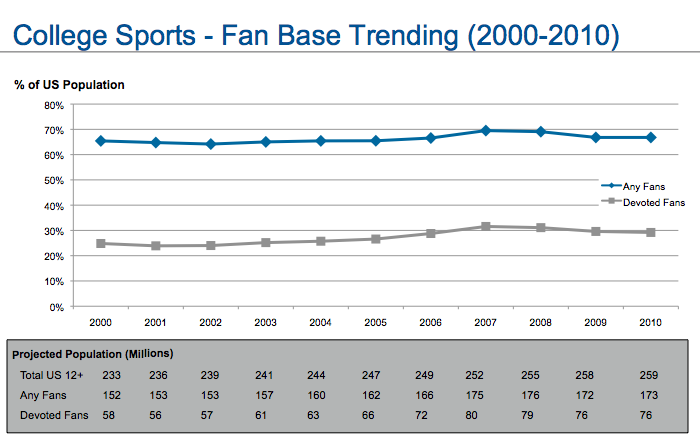 ESPN collects historic game data, including attendance, going back to 2001, for several professional sports. However, Peter Von Allmen, an academic economist and current president of the North American Association of Sports Economists (NAASE), referred me to the [sport]-reference.com websites as an excellent source for historic sports data going back much further than ESPN’s data. Note: NBA data is collected for 1981-2016. Attendance figures are actually available going back to 1946, but only for a couple teams per season. On average, fantasy sports players (age 18+) spend $465 on league-related costs, single-player challenge games, and league-related materials over a 12-month period. Up from $95 in 2012 (src: press release). src: Fantasy Sports Trade Association. “Industry Demographics.” Accessed May 4, 2016.